Spectators watch Albion's JV youth football team, Lonnie's All-Stars, take on the Jackson Thunder on a crisp Sept. 22 afternoon. (Photo by Andrew Wittland). In 2012, Albion High School pulled the plug on its football program, ending the city’s beloved Friday night tradition. Fast forward six years, and the community has traded its Friday Night Lights for Saturday morning sunrises, as Albion’s youth football program has become a focal point for the community. 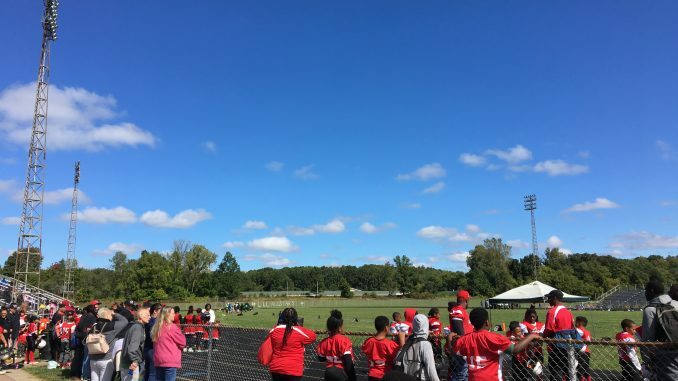 That focality was all the more apparent this past Saturday, as the city of Albion once again gathered at Wildcat Stadium for a homecoming game of sorts, except this time to draw attention to something bigger than the game itself: gun violence. On June 23, Albion resident Lonelle “Lonnie” Langston was shot and killed in Kalamazoo. Langston’s death sent a shock wave through the community, as the third homicide in the city of Kalamazoo that summer had hit home. A graduate of Concord High School, Langston was a beloved member of the Albion community. He was present in Saturday’s game. The environment at Albion’s stadium was much akin to that of a primetime high school game: enthused parents, a busy concession stand and the clashing sound of pads hitting each other. It all contributed to the classic small-town football feel. However, a bigger presence was also apparent. Homemade posters lined the fence around the field, many of which featured pictures of Langston and messages of remembrance, along with the hashtag #LLLAllStars. Albion’s own JV youth football team —Lonnie’s All-Stars — was, in itself, a tribute. Players donned orange uniforms, a color symbolizing gun violence awareness. This game gave the community the same familiar youth football experience, but with a newfound sense of hope and resilience. Jacques Harris, the Albion Youth Football director and a close friend of Langston’s, helped spearhead the event, and he felt it was a positive step in preventing gun violence in both Albion and other communities. The final score did not turn out in favor of the All-Stars, as they fell 33-6 against the Jackson Thunder. However, Saturday’s game was indicative that despite tragedy and violence, a community can form cohesion for the greater good. It’s something that even the greatest of sports stories can’t always preach.